HELEN McCarthy has been able to squeeze the history of manga into less than a hundred small pages. 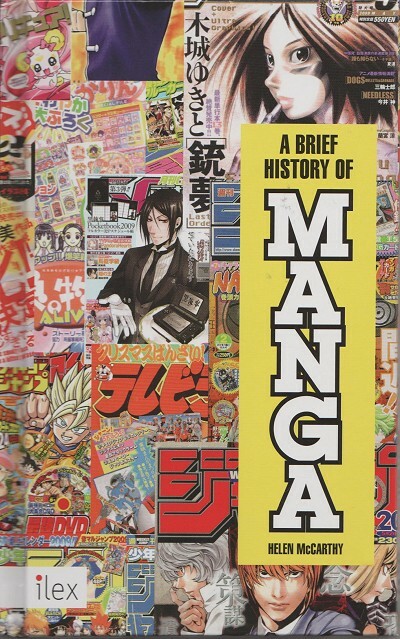 Despite some shortcomings A Brief History of Manga is an excellent guidebook to almost all major events, people and genres. British Helen McCarthy (1951-) is one of the best known Western experts on manga, anime and all Japanese popular culture. Among other things, she has published books on Hayao Miyazaki’s and Osamu Tezuka’s works. Currently she is working on a documentary on the history of manga. McCarthy’s latest book A Brief History of Manga (Ilex, 2014) is of the same guaranteed quality. Fitting the entire history of manga into less than one hundred pages is practically impossible, but McCarthy has managed the huge task of including and excluding with flying colors. The text is small and there is quite a lot of it. McCarthy keeps the expert text interesting by adding luscious details and using plenty of illustrations. Almost all of the milestones in the history of manga are also marked on timelines. The different colors of the timelines have obviously some meanings, but I could not figure out all of them. It would have been nice to have the colors explained. MANGA as we currently know it was born around the 1860s, when a fertile collision of western and Japanese visual and narrative cultures happened in Japan. Before that there was already many centuries of history. McCarthy presents all the most important starting points. Once, manga was born around the year 700 CE. From that period are the oldest known Japanese cartoons – some workers drew funny images of their bosses on the ceiling beams of the Horyu-ji temple in Nara. The images were discovered in the 1930’s. Another starting point is the 12th century, when the Buddhist priest Toba Sojo drew andropomorphic frogs, monkeys and other animals in his scrolls. The images were mocking devout monks. Those hilarious pictures were so popular that for centuries cartoons were known in Japan as Toba-e, ”Toba pictures”. The third starting point is when poet, writer and artist Santo Kyoden in 1798 used for the first time the word manga (”random images”, ”sketches”). Then in 1814 the word appeared in the names of two books. One was Aikawa Minwa’s Manga Hyakujo (”A Hundred Pictures of Girls”). The other was Katsushika Hokusai’s Hokusai Manga (”Hokusai’s Sketches”). The fourth beginning is the 1860’s, when Western caricatures arrived in Japan along with some travelers. British Charles Wirgman founded the first satirical magazine Japan Punch in Yokohama in 1862. During the following years a number of other cartoons magazines were born, and died. Yet a fifth time can be marked. In 1902, Jiji Manga, a supplement to the Jiji Shinpo newspaper, published a comic by Rakuten Kitazawa called Tagosaku to Mokube no Tokyo kenbutsu (”Tagosaku and Mokube’s Trip to Tokyo”). The adventures of two countrymen in the big town were probably the first comic by a Japanese artist published in a Japanese journal. The career of ”The God of Manga” Osamu Tezuka is in any case too late to be called the emergence of modern manga. Tezuka’s debut was the newspaper strip Maachan no nikkichou in January 1946. FROM Kitazawa’s time on Helen McCarthy takes us year by year through the most important turning points, major artists and development of styles in the history of manga. She brings us through Ippei Okamoto, Machiko Hasegawa, Suiho Tagawa, Gajo Sakamoto, Osamu Tezuka, Mitsuteru Yokoyama, and many others up to the present day. Finally we come to works like One Piece, Naruto, Death Note and Bleach, but also to la nouvelle manga, Hideo Asuma, Axis Powers Hetalia, and Attack on Titan. We will see the shrinking of big manga magazines, and the spreading of manga in the internet and mobile phones. And finally the desperate struggle for survival, with manga artists against piracy that has grown into an enormous industry. There are very few significant flaws in Helen McCarthy’s book. However, two names are missing that I think should be included in any history of manga, however short: Noboru Oshiro and Shigeru Mizuki. Noboru Oshiro (1905-1998) was in the 1930’s one of the foremost artists who brought European and American ways of drawing comics to Japan. Shigeru Mizuki (1922 -), in turn, is by far the most important manga artist alive. Missing the father of Kitaro and the artist who turned Japan’s military history into manga cannot be justified. Adding some other names to those McCarthy presents is mainly a matter of taste. Personally, I might add, for example, some notable manga artists who have made their most well-known work in anime: Hayao Miyazaki, Satoshi Kon, Mamoru Oshii. THE INTERACTION between Japanese and Western comics and graphic novels is, of course, a two-way street. In addition to just being influenced, the Japanese have taken some whole characters: they have made their own versions of Mickey Mouse, James Bond, Batman and many others – sometimes legally, sometimes without authorization. Similarly, numerous Western artists have been influenced by manga. McCarthy has carefully tracked the spread of the manga to the Western market. She misses The Four Immigrants Manga, which was published by the japanese-born Henry Kiyama in the United States in 1931, but otherwise the history is all there. The first Western translation of manga almost came in the United States in 1969. But the American publisher could not cut a licencing deal for Takao Saito’s story Myunosuke. Thus, the first Western manga translation was published in the French Budo Magazine Europe, which printed Hiroshi Hirata’s manga Bushido Muzanden in October 1969. Americans’ interest in manga finally woke when Takao Saito’s work 0011 Napoleon Solo was presented in Westercon in 1970. Keiji Nakazawa’s Barefoot Gen (Hadashi no Gen, 1973) was published in English in Japan as early as 1976, but an edition aimed for the U.S. market came out only in 1978. The memory of Hiroshima was noticed all over Europe, too: The same story was the first manga series translated into Italian in 1980, German in 1982 and French in 1983. Finland is mentioned twice in The Brief History of Manga. Hadashi no Gen’s Finnish and Swedish translations were the first manga in Scandinavia in 1985. (The Finnish translation was seriously mutilated; many pages were badly rearranged to change the reading direction.) Finland appears again when McCarthy presents Akira Toriyama’s Dragon Ball. A selection of translations is shown; one of them is the first part of Dragon Ball which was published in Finnish in 2003. It practically started the current manga-boom in Finland. Now manga is a significant part of the mainstream in comics and graphic novels also in the West. It is rapidly moving from paper to digital, and the possible revenue models for authors and publishers are still being searched.